DOG'S GRASS, or COUCH GRASS. Canis Gramen. This is called Dog's Grass from its efficacy in relieving dogs when sick. 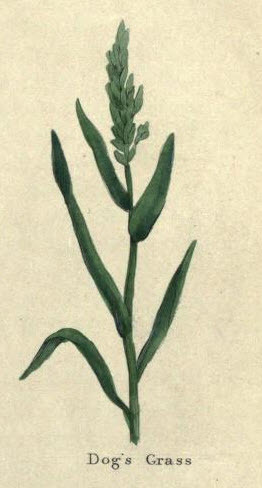 It is well known, that the grass creepeth far about under the ground, with long white jointed roots, and small fibers almost at every joint, very sweet in taste, as the rest of the herb is, and interlacing one another, from whence shoot many fair grassy leaves, small at the ends, and sharp on the edges. The stalks are jointed like corn, with similar leaves, and a spiked head, with a long husk in it, and hard rough seed. Watch the dogs when they are sick, and they will lead you to it. It grows almost everywhere. It is the most medicinable of all the Quickgrasses. As a decoction it opens obstructions of the liver, gall, and urine; and eases the griping pains of the belly, and inflammation; and frets away stone in the bladder, and ulcers. The roots bruised and applied heal wounds. The seed is the most powerful. The distilled water with a little wormseed, kills worms in children. The way is to bruise the roots, and having well boiled them, drink the decoction; it is opening, but not purging, very safe; a remedy against all diseases arising from obstructions; and fully one half of diseases spring from this cause; therefore this herb is invaluable.